First it was iOS, now Android is pulling in more revenue from gaming than the dedicated handheld console industry. That’s according to the latest report from App Annie and IDC, which estimates that Android’s gaming prowess overtook the combined efforts of Sony’s PSP and Vita, and Nintendo’s DS, DSi and 3DS in Q2 2013. It’s a far cry from the inaugural report in February 2013, which put revenue from dedicated handled consoles above iOS and Android — though revenue from the two mobile platforms was higher when combined. Apple’s platform went on to surpass the console firms’ mobile efforts one quarter later, and now Android has followed suit. The report also found that the share of game revenue from Asia Pacific increased for iOS and Android titles, while Western Europe “rebounded” in terms of revenue for Sony and Nintendo’s handheld consoles. 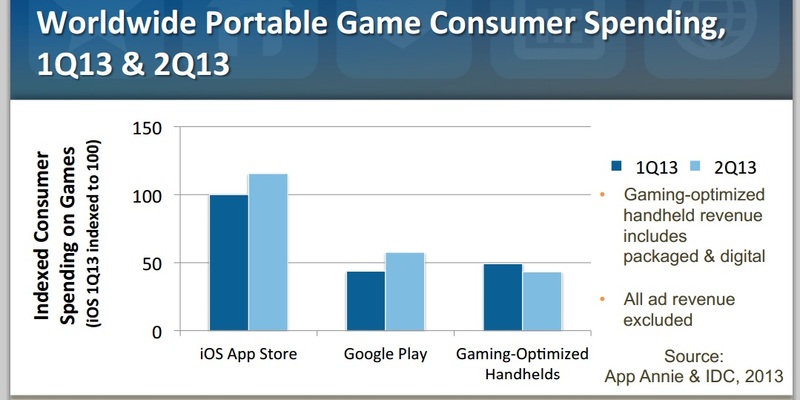 Overall, the trend towards mobile gaming continues. To that point, App Annie and IDC found that consumer spending on iOS and Android games combined was four times greater than that of Sony and Nintendo’s handhelds in Q2 — that’s up from a 3X difference in the previous quarter.